I love this image recently posted over the weekend. 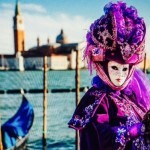 The Carnival of Venice kicked off this past weekend in Italy. Every year the folks at Pantone announce a color of the year and they landed on the color Orchid for 2014. We’re starting to see hints of the color all over the place. This Venetian photo with the orchid costume caught my eye against the Adriatic Sea and St. Mark’s Square. If you love architecture or art history, Venice is the city of your choice.